Destination weddings are fast becoming the fad nowadays in the wedding industry. There are a lot of couples who tend to veer away from the common church weddings within their location, and they select to have their wedding celebration in faraway places where travel is necessary, not only for them but also for their invited guests, suppliers, and organizers. You may also see invitation samples. If you want to have a destination wedding ceremony, make sure that your destination wedding invitation is as grand as the wedding that you have in mind. 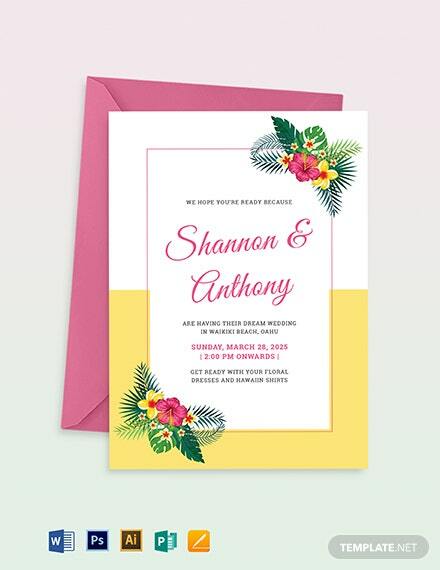 We can provide you with samples of destination wedding invitations and other Invitation Templates, which you may use in other events and occasions. Since you will hold your wedding in a destination that is far from where you do your daily functions, you can use a photo of the destination as the background of your destination wedding invitation. It can be the beach, a garden, or the church where you will be wedded. It all depends on the usage of the place for your wedding ceremonies. You may use icons and symbols where the destination is known for so that your destination wedding invitation can evoke the character of the location where you will be wedded. You can also make use of the landmarks and other famous places in the location of your wedding so that the guests of the wedding will be more aware of the destination where your wedding will be held. Moreover, you can use different modes of transportation as an additional design material. It will be better if you will incorporate the vehicle or any other transportation means that your guests will use to be able to go to the wedding location. Aside from our samples of destination wedding invitation templates, our samples of Winter Wedding Invitations are also available for download. Destination Wedding After Party Invitations are sent to the guests of the wedding who are invited for a more intimate party in the specific destination after the wedding with either the bride, the groom, or both of them. Destination Wedding Reception Invitations are created and given out to provide information regarding the reception details of the wedding, which may include the location of the reception, the kind of food service that the guests may expect, and the seating numbers and arrangements of the guests. Destination Church Wedding Invitations, Destination Private Wedding Invitations, Destination Pocket Wedding Invitations and Destination Garden Wedding Invitations allow the guests to know the kind of destination wedding that will be held. Destination Disney Wedding Invitation and other themed destination wedding invitations may be used if the couple wanted to add character to their wedding invited and wedding ceremonies. Truly, it is a great feeling to have your wedding in your dream location. Moreover, providing a visually appealing and attractive destination wedding invitation can make the wedding even more exciting, not only for the couple but also for their guests. 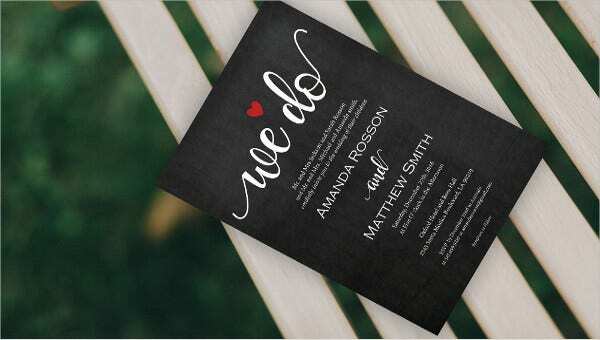 For more ideas on designing wedding invitations, you can download our samples and templates of Chalkboard Wedding Invitations.